Kathy Giuffre wants to escape from her stressful life working full-time and raising two young children on her own. When a new boyfriend agrees to join her for a year in Rarotonga with her young sons, she takes a sabbatical from work, books their flights and packs their bags. Then at the last minute her boyfriend announces he isn’t coming. 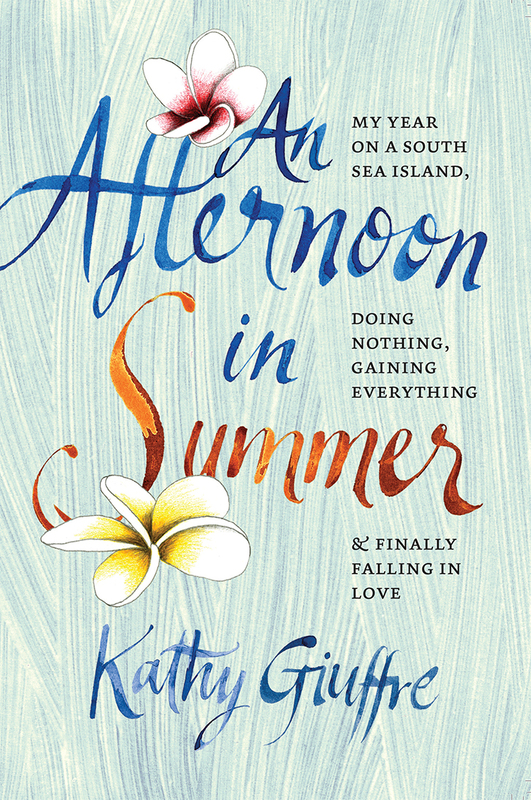 In captivating style Giuffre tells what happens when she finds herself alone with her boys on Rarotonga, a tiny speck in the middle of the South Pacific Ocean, 11, 000 kilometres from home. She knows no one, the house she’s been promised doesn’t eventuate, and almost every other outsider is on a ten-day package tour. Her unlikely saviour is Emily, an 82-year-old Maori woman with a large white house on the edge of the ocean, which the two women share with two callous missionaries, the ghosts of Emily’s ancestors, and, briefly, a bizarre couple from Eastern Europe. As time passes, Kathy is seduced by the island, embraced by its people and by feelings she has never experienced before. An Afternoon in Summer is an inspirational book about searching for something better from life, and finding it – serenity, sensuality, and ultimately love. Print edition: Available at all good booksellers in New Zealand, Australia, US and Canada. Other customers, please order directly below. Kathy Giuffre gives her recommendations on where to go and what to see in the Cook Islands here. Kathy chats about her experiences and her book on Pasifika Truthfully here.